Directors, artists, and writers of animated cartoons are well loved by fans of their work. They make the world of imagination come to life for all to see. But it seems that the most worshiped of all who work on a cartoon are the voice actors. They breath life into their characters - giving personalities and human characteristics to the most unlikely of objects. And it is those voices that ring in our ears long after the show has been cancelled. It went by unnoticed, but in 2002 and 2003, we lost two of our beloved Rainbow Brite voice actors: Les Tremayne (Orin, Bombo, TV Announcer) and Jonathan Harris (Count Blogg). And while it may seem silly to some, I feel as though we've lost not only the human voices behind the characters, but also the characters themselves. 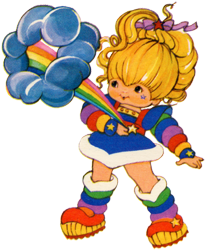 I'm not holding my breath for a new Rainbow Brite cartoon, but if one ever were to come to pass, I would hope that Orin and Count Blogg would be left out of it. It just wouldn't be the same. Wherever Les and Jonathan's souls are now, I hope they can hear me when I say "thank you." Count Blogg made us hate him, while we couldn't help but fall in love with ancient Orin. These gentleman, like their characters, will be missed. RIP you guys.